Volvo Selects CIT for Design and Prototyping Automotive Racks - C-I-T | Manufacturing Innovation. World Class Customer Service.C-I-T | Manufacturing Innovation. World Class Customer Service. As of early April 2017, CIT has begin working with global automotive giant Volvo Cars, one of the most well-known and respected car brands in the world with sales in about 100 countries. “Volvo was interested in very specific design and prototyping approach for racks with two outcomes in mind – lowering transportation costs and increasing part protection. Our design team focused on maximizing parts per rack and size per rack. We worked with models of the parts and the footprint so we can achieve these goals,” said Jeff Hazelett, Director of Regional Sales at CIT. CIT’s design team approached this design project with a full understanding of Volvo’s European precision standards. 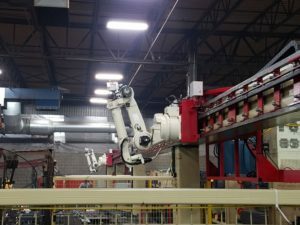 The company has built out a new automated manufacturing cell which relies heavily on custom robotics to dramatically increases flexibility and enabling 4 different components of the rack to be completed at the same time. “We needed robotics that aren’t available – so we designed and built our own robots – all the with the intent of taking automation and flexibility to a different level. Racks are an important mechanism for ensuring safe transportation of class A parts – most people don’t realize all the design thinking that goes into them. Volvo does and that’s what make this partnership so exciting,” said Greg Mounsey, Plant Manager at CIT. If you’d like to tour CIT and/or discuss a customized approach to solving a design and prototyping project for your manufacturing company, please call Mike Owen at 8664391439.